Can You Win the Content Marketing Arms Race? 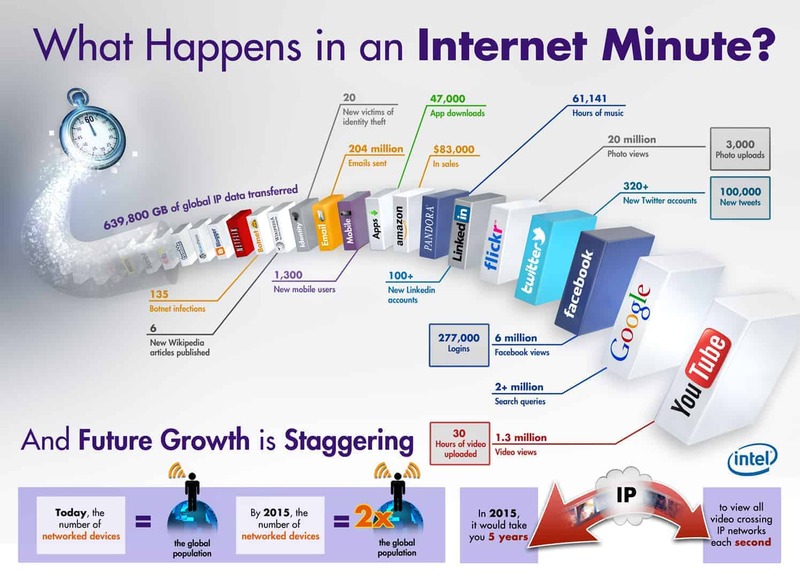 Every minute there are 100,000 new Tweets, 40,000 Facebook updates, 40,000 Instagram photos and 30 hours of YouTube videos added to the Internet. That is an enormous amount of new content being generated every minute of every day. Much of this content is coming from marketers and the deluge will only get worse as more marketers become content marketers. The volume and frequency of content is increasing. In a Content Marketing Institute survey, 69% of marketers say they are creating more content in 2015 than they did one year ago. Looking ahead, 59% expect their organization’s content marketing budget to increase in the next year. Of these content marketers, 48% publish new content daily or multiple times a week and they are creating content for an average of 13 different content marketing tactics. The amount of content being created is exploding. Yet the more content we create the harder it will be to get our content seen. Each individual piece of content will become less and less effective. This will lead to more content creation and more frequent publishing. A similar thing happened with advertising over the last several decades. More ads were placed in TV shows, more banner ads were placed online, more and more ads were placed everywhere such as sidewalks, elevators and bathroom stalls. The end results was an enormous amount of advertising clutter. One look at Times Square in New York City gives you a visual depiction. Because of this clutter each ad has become less effective. In 1965, consumers recalled 34% of commercials they saw, but by 1990 recall of TV commercials dropped to just 8%. By 2007 people could only remember two commercials they saw in a day. Social media was a way to get away from advertising clutter. However, now it seems that social media may become just as cluttered as advertising. With each social network being flooded with more content, reach is dropping. New social channels spring up only to increase the content clutter. For example, Facebook reported that the average person saw 1,500+ newsfeeds whenever they log onto Facebook This was too many to possibly read. So they narrowed the feed to show only about 300 through adjusting their algorithm resulting in a drop in organic reach to 3%. Competition is increasing and it is becoming harder for any one piece of content to gain exposure. I believe the answer to this content race may lie within one-on-one engagement. Despite the explosive growth of social content, the medium number of friends a user has on Facebook is still only 200. Even if you have thousands of followers on Twitter, how many of those user’s Tweets do you see in a day? How many do you engage with on a regular basis? No matter the increase in content and channels we sill have a limited amount of time to engage. This makes me think of a long tail strategy for SEO. Here you use key phrases to narrow to a smaller audience of those more likely to be interested in our content and convert. Perhaps this thinking can also apply to social content where the long tail focuses less on reach and more on engagement with a smaller group. Thus content becomes more important for engaging current fans rather than for generating awareness – something traditional advertising in mass media can do better. So perhaps as social content gets more crowed we should not abandon traditional advertising. Use paid advertising for mass awareness and concentrate social media on interaction. Social can still generate awareness, but without paying you will mostly likely gain that awareness through engagement. In the content arms race social media becomes less of an awareness medium and more of an interaction medium Click To Tweet. This leads to a renewed call for integration of traditional and social. One effort is not enough. Social media is more effective when you add paid media to help meet your goals. In 2009, the trade publication Advertising Age, pronounced that the ad age was over after the prestigious advertising award show Cannes was swept by PR, integrated and Internet winners. David Lubars, chairman-chief creative officer of BBDO said, “The way the world is heading is voluntary engagement.” I believe they were half right. We have entered an age of engagement, but the ad age cannot be left behind. To win in this race you need both.